I left peacetime Korea for a stateside duty assignment. My assignment was going to be at a University or College in the Chicago area. I wanted an assignment in Virginia where my wife was. I arrived in Fredericksburg on furlough and while there tried to get back to Camp A P Hill. There were no openings there, but one existed for Fort Ritchie, Md. My change of orders hadn't arrived by the time my furlough was over. Another phone call and I was told to go to my new assignment. I reported to the MP Company at Ft Ritchie and told them that my orders would follow. A month had passed and no orders. My first sergeant told me that he needed the orders. In the meantime I guess I was being carried AWOL at the Chicago unit. Another telephone call and the orders finally arrived. I was assigned to the Provost Marshal's office. One of my first assignments was to penetrate the underground Pentagon. Ft Ritchie is in Maryland close to the Pennsylvania border. Across the border in Pa is Site R. They knew I would be caught. With some good help and a fake pass I got in and out and went back in again. The place was in turmoil, the impossible had happened. The Provost Marshal came down hard on the security platoon on duty. Two days later I was told to do it again, but this time everyone was on their toes and I was caught. Security changes were instituted and a computerized system was eventually put into use. My next assignment was to head a security platoon. This was shift work and was not my cup of tea, and I finally worked my way out of that job. Next assignment was as a Provost Marshal investigator. I did my job too well. I found that one of the security platoon officers was involved in petty theft. On one occasion a case of butter and another, Polaroid film was stolen. I reported it to my boss, even though I knew he was a close friend of the lieutenant involved. Before I knew it I was given an assignment in Maryland at one of the sister sites. My job was to secure a field of 500 acres of antennas, which were used for around-the-world communications. My military police unit there included dogs. Due to my being required to go to Ft Ritchie, one day, I was unable to follow thru with my morning routine, which included a check of the kennels. A storm came up and the dog house door locked shut. The dog's handler was on pass and the handler going off duty didn't notice the problem. That particular dog required more water than the others because of a kidney problem. After the storm the hot sun raised the temperature in his kennel and he was found dead the next day. The Army wanted someone to pay the $2500 to replace the dog. I was in charge, so I was the one. I eventually won, but the time and sweat spent, to prove my innocence, was unbelievable. It is awful to say, but I don't believe I would have had to go through as much if I had lost one of my MP's. The new assignment had cost me a lot more money, since the distance to my work place was three times as far. I persevered and when a new security officer replaced the old one, my site was the only one with proper security. As a result I was moved back to Site R to take over the job there. The site was self-contained and self-sustained. Of course there has to be a time limit as is governed by the amount of food vs the number of occupants. Main street differed from other main streets because there are no store fronts, no homeless, kids or drug dealers on it. There were parking spaces and traffic lights. The seal-tight doors were balanced perfectly and could be opened by one person. There were no outside door handles. Once closed they could not be opened from the outside. There were ponds, power plants, post office, barbershop, snack bar, mess hall, and a crematorium; all the comforts of home. Alerts could and did come at anytime. Battle teams were on duty for long periods of time, 24 hours a day. If you were out and you received an alert you had X number of minutes to enter. At X time the doors were closed, only to be opened upon command of the top man. I did see a time where a colonel tried to pull his rank to gain entrance, only to be left outside, fuming, until the alert was over. We were buttoned down one time when all indications were that it was not an alert. Some electronic sensors had responded incorrectly and had given an automatic alert. Checks were made for external radiation and they were negative, so the order was given to open up. My wife asked me if I thought of her during such a crisis and my answer was that I was too busy to think of other things. The entire mountain was fenced in and was protected by dogs and their handlers. These dogs were not the ordinary type. They were vicious and sometimes would turn on their handlers. Whenever one escaped the locals in the area were warned to stay indoors. A stray dog was usually tranquilized, with a dart gun, and then brought back home. I heard of one of the handlers, who had seen a wildcat enter his area. He gave his dog the command to attack. It did, and the cat was killed. The dog needed some minor repair work. It has been almost thirty years since I was there. Time changes all, so I haven't given away any deep dark secrets. The Tunnel was started during President Harry Truman's tenure and showed a real vision on someone's part. I was very proud when I saw what had been done to preserve national security. I'm attaching a certificate of achievement to show that I was there and a newspaper article which told as much as I did. I would bet that there are 5 three story office buildings there today. for a truly meritorious performance of duty during the years 1963-1964-and 1965. As a Military Police non-commissioned officer he was initially assigned duties commensurate with his grade and experience and in each assignment demonstrated a high degree of professional competence and leadership ability. 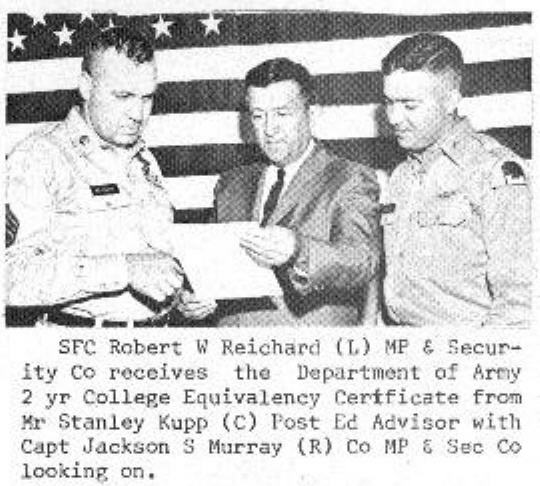 In view of his demonstrated abilities, Sergeant Reichard was given the responsibility of Security NCO, at a very sensitive, highly classified, installation. In this capacity, and in the absence of an officer's supervision, he implemented existing security measures, introduced improvements which strengthened the physical security program, simplified the administrative procedures in effect, and through exercise of sound leadership techniques, was able to obtain maximum effort from his subordinates. Sergeant Reichard distinguished himself from his contemporaries by a sustained outstanding performance of duty, a very high standard of personal conduct, and a sincere interest in self-improvement. 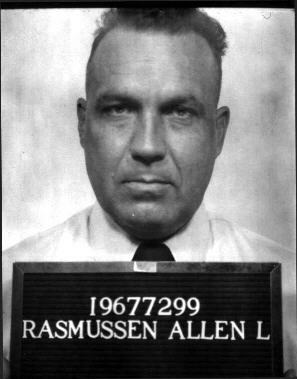 Sergeant Reichard's transfer from the installation resulted in a distinct loss to the Military Police effort, of the Provost Marshal Office. Source: The Frederick Post, Frederick, Md., dated Nov 8 1952. Washington, Nov 7 AP.--The Army said today it still considers information on its underground "alternate Pentagon in Maryland secret. It took this stand despite the fact that the Army Engineer's Office here has issued a book containing some data on the 35 million dollar project at Ft Ritchie, Md. Most of the data has previously been published in newspapers. A photograph and some general information on the cave, which has been hollowed out under Raven Rock Mountain, was included in a historical summary of the work of the Corps of Engineers in Washington DC and vicinity 1830-1952. In reply to questions, a spokesman for the Army said the historical book was issued by the district office without the usual security review required by the Pentagon and without approval of the office of Lt Gen Lewis Pisks, chief of the Corps of Engineers. The spokesman said Pick's office is looking into the matter. Although photographs of the installation and detailed accounts of the project have been published at various times during the last two or three years, Army public information officers said today they were still unauthorized to give out even the information already widely known. The cavern will include an alternate communications center, for use in the event the Pentagon is knocked out by enemy attack, with a connecting transmitter station at Greencastle, Pa and a receiver at Sharpsburg, Md. Describing the excavation at Ft Ritchie, the book says; Here one half million cubic yards of the hardest rock, on the east coast, was blasted out and hauled away in ten months. In the hole created, a three story building is being erected. This building stands behind two heavy steel blast doors that close the tunnel openings during an alert. Special means are provided for ventilation, gas and biological agent filtering, emergency power, and reserve water supply.